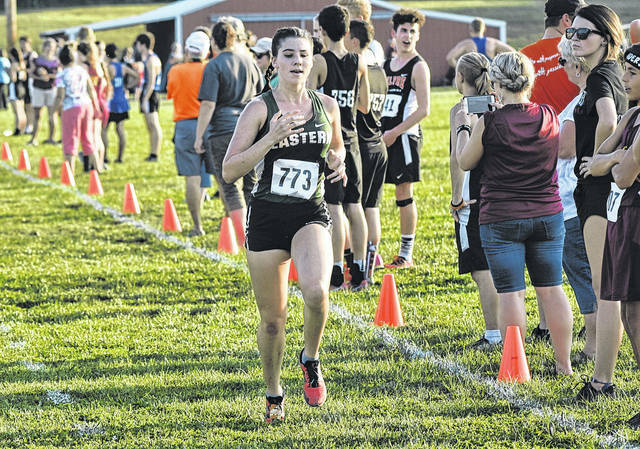 Eastern’s Rhiannon Morris strides toward the finish line at the Federal Hocking Invitational on Sep. 19 in Stewart, Ohio. 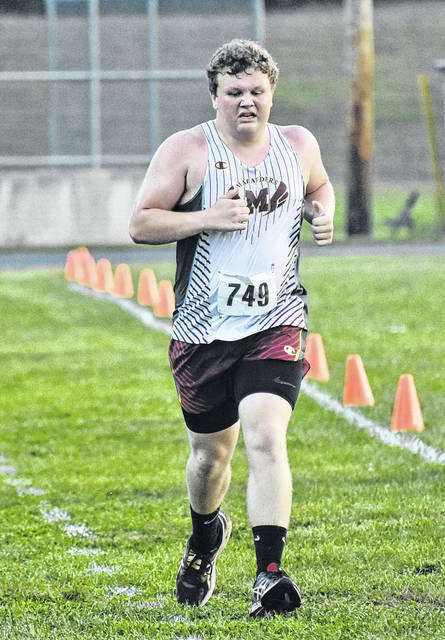 Meigs’ Brandon Justis strides toward the finish line at the Federal Hocking Invitational on Sep. 19 in Stewart, Ohio. RIO GRANDE, Ohio — The Eastern, Gallia Academy, Meigs, Southern and South Gallia cross country teams competed at 48th Patty Forgey Invitational held Saturday on the campus of the University of Rio Grande in Gallia County. A total of 34 teams and 348 varsity participants competed in the event, with Woodrow Wilson coming away with the boys team title and Caldwell capturing top team honors in the girls event. Both varsity races featured well over 100 runners apiece, with 202 boys and 146 girls taking to the course in the separate competitions. Woodrow Wilson posted a winning score of 59 points in the boys race, finishing 24 points ahead of runner-up Rock Hill (83). Eastern’s sole representative was Colton Reynolds who placed 17th overall with a mark of 17:58.91, posting the highest finish of local boys runners in the event. The Rebels’ lone representative Griffin Davis placed 38th with a mark of 19:07.82. Gallia Academy placed 17th overall in the team standings with 482 points, as Chancy Odom (20:36.16) paced the Blue and White with an 80th place effort. Nicholas Sheets (21:22.47) was next for GAHS with an 113th place finish, while Gryatt Schwall (22:17.19) and Ethan Saunders (24:49.32) followed with 134th and 170th place efforts, respectively. Caleb Danford finished 190th with a mark of 27:51.29, while Chris Dennison (29:52.96) followed with a 197th place effort to round out the top-six finishers for the Blue Devils. Meigs placed 19th overall in the team standings with 490 points, as Colton Heater (20:18.79) led the way for the Maroon and Gold with a 72nd place finish. Landon Davis (22:24.68) was next for MHS with a 136th place effort, while Christian Jones (22:32.99) and Joseph Cotterill (23:43.88) followed with 137th and 157th place finishes, respectively. Brandon Justis (31:22.22) rounded out the top-five efforts for Meigs placing 198th. Chris Barbera of Woodrow Wilson won the boys race with a time of 16:44.22, with Eli Fullerton of Belpre coming in second with a mark of 16:59.46. Peebles’s Jenny Seas won the girls race with a time of 21:13.54, while Bekah Howard of Ashland Blazer was the runner-up with a time of 20:35.95. Caldwell came away with the girls team title after posting a winning total of 67, while Fairland was second with 68 points. Eastern (104) and Gallia Academy (339) were next finishing fourth and 12th, respectively. Rhiannon Morris was the top local finisher in the girls event,setting the pace for EHS with a seventh place effort of 21:02.43. Ally Durst (21:44.06) was next with an 11th place finish, while Whitney Durst (23:45.30) followed with a 36th place effort. Lexa Hayes (24:27.35) and Ashton Guthrie (24:38.50) were next for the Lady Eagles with 46th and 51st place efforts, respectively. .
Alysa Howard (27:02.35) and Megan Ross (30:06.15) rounded out the top-seven finishers for Eastern with 86th and 115th place efforts, respectively. Southern’s Sydney Roush led the way for the Purple and Gold, placing 19th with a mark of 22:25.15. Mallory Johnson (24:26.32) and Kathryn Matson (27:05.08) were next for the Lady Tornadoes, posting 45th and 87th place efforts, respectively. South Gallia was led by Jessica Luther who placed 59th with a mark of 24:55.88, while Cara Frazee (25:50.18) rounded out the Lady Rebels’ top-two finishes with a 69th place finish. Kristen Jamora (26:38.29) led the way for the Blue Angels with a 79th place finish, while Eliza Davies (26:46.32) and Inex Perez (27:21.73) followed with 82nd and 90th place efforts, respectively. Carlin Short (32:34.52) and Sydney Greenlee (34:08.65) were next for GAHS with 130th and 133rd place finishes, respectively. Madison Connelly (36:48.33) was next with a 134th place effort, while Kaytlyn Lindamood (38:06.37) closed out the top-seven finishers for the Blue Angels with a 138th place effort. For the Lady Marauders, Madison Cremeans was the lone participant, finishing 60th with a mark of 24:59.26. Visit baumspage.com for complete results of the 48th Patty Forgey Invitational. Editor’s Note: This story will appear in the Wednesday sports editions of the Gallipolis Daily Tribune, Point Pleasant Regoster and The Daily Sentinel.